Arms dealing is typically not high on the list of promising career opportunities for ambitious youngsters. It takes a certain brand of amoral idiot to not only sell guns but to seek it out as a permanent career. 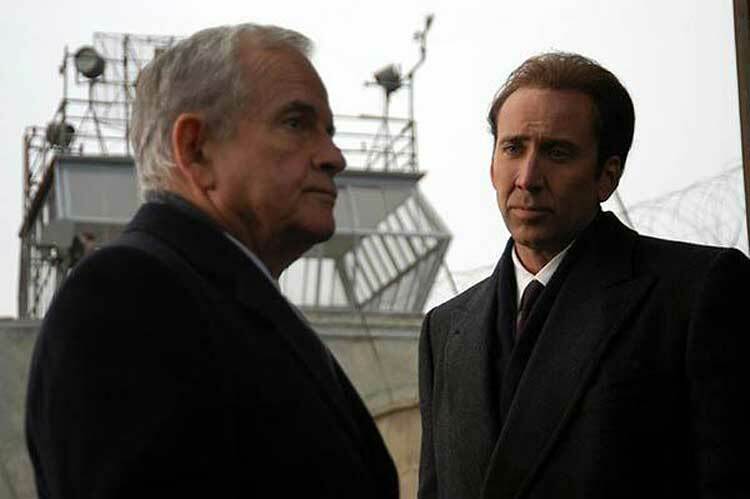 In Lord of War, Nicolas Cage plays Yuri Orlov, an immigrant from the Ukraine looking to make a name for himself in Little Odessa. Beginning with a few gun sales and then recruiting his younger brother Vitaly (Jared Leto), Yuri quickly builds a serious business as a major player. He rarely considers the consequences of his work and justifies it by saying that someone else would just take his place. His approach treats the arms deals like any other transaction. He’s making a fortune by giving warlords (and governments) what they want, even if they use his products to cause death. Cage seems like a good fit to make Yuri entertaining by going big and making him larger than life. Instead, he’s written by Andrew Niccol as a straight arrow who just happens to sell weapons and ammunition. He’s the used car salesman of arms dealers and is very dull. His voiceover monologues grind the pace to a halt and are missing much wit or depth. Yuri’s not in denial about the use of his weapons, but he doesn’t really care either. On the other hand, Vitaly can’t take it and ends up succumbing to drug addiction. He lacks the certain banal immorality needed to succeed in this trade. Niccol (Gattaca) also directed the film, and he uses some inventive techniques to keep us engaged. The credits sequence follows the path of a single bullet from its creation right until it enters the head of a young boy. This is a nasty sequence and a bit of a gimmick, but it also has a clever energy that’s missing from much of Yuri’s story. Cage even looks bored in the poster. When you call a movie Lord of War, you expect that it will make the title character a charming superstar. We also have Ethan Hawke as the lawman pursuing Yuri and Bridget Moynahan as the fashion model he pursues. The actors give it a shot but are trapped in the typical roles of the obsessive cop and clueless spouse. Lord of War is a fairly well-made film with a believable story, but it just sits on the screen. There are a few stunning moments of graphic violence, but they rest within a lot of bland scenes. And some of these forgettable moments even involve the great Ian Holm as a fellow arms dealer. His fate appears to show how far Yuri has fallen, but it’s not like he started out as a great guy. The logical next step from selling arms was to be directly involved in murder. By that point, we’re just waiting for his end to come. It’s not like redemption is just around the corner. He’s just a corrupt businessman waiting to get the ultimate pink slip. I liked this movie quite a bit and I loved both of the opening sequences - the life cycle of a bullet and the one with Cage's character standing among thousands of spent cartridges and saying - "There are over 550 million firearms in worldwide circulation. That's one firearm for every twelve people on the planet. (takes drag off cigarette) The only question is: how do we arm the other eleven?" Chip, I just realized that I never responded to this comment. I agree that the opening sequence of Lord of War is great. I just don't think the movie as a whole lives up to the start. It was surprisingly dull, which is rare for Cage.